These days it seems like every time you venture down the road there’s a new snappy church sign find. Most times these signs are meant to be hilarious and they even compete with one another to see who can make the world at large laugh (or perhaps can gain more parishioners). At this point, there could be a separate award show specifically for funny church signs. 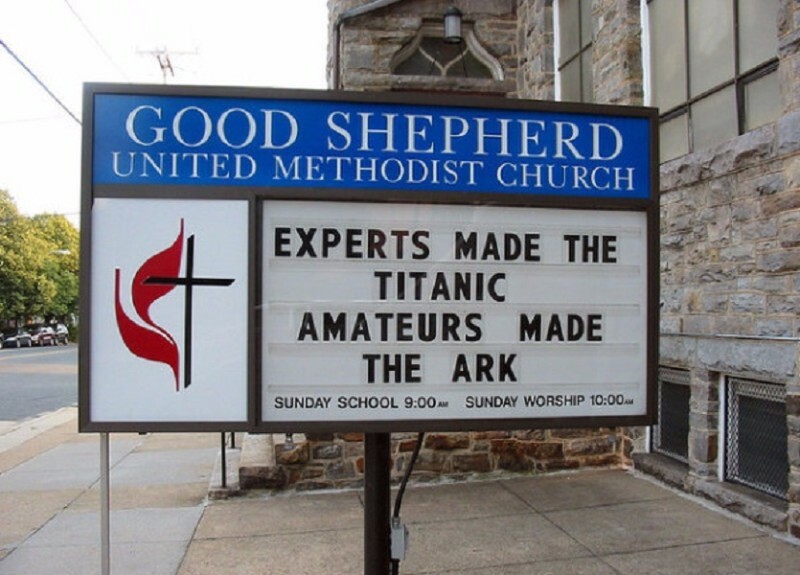 Check out this list of hilarious church signs, and remember most of them are just about the laughs! This sign took a dig at the architects who made the Titanic. While (as far as we know) the Ark didn’t get clipped by a giant glacier, the sign still makes a funny joke about the amateur carpenter Noah taking up the huge task of making a massive Ark. The overall message of this sign is to let you know that God’s work is better than regular human work. The sign is more so intended to get those who drive by that don’t go to church to try and come to church. It plants a seed in their head so that hopefully over time when they see man-made things not working they can turn to God. If this sign is actually successful it’s anyone’s guess!